Born in Palermo, Italy, in 1973. 1997: Degree with honor in Medicine and Surgery from the University of Palermo, Italy, winning a Prize for best thesis. 2002: Specialist in Anatomical Pathology at the University of Palermo, Italy. 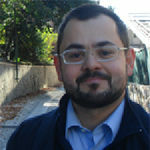 March 2001 to October 2010: Assistant Professor of Human Anatomy at the Schools of Medicine, Pharmacy and Biology of the University of Palermo, Italy. November 2010 - date: Associate Professor of Human Anatomy at the School of Medicine and Surgery, University of Palermo, Italy. Publications in scientific journals with I.F. : 83 (I.F. : ~250; HI: 13). Publications in scientific journals without I.F. : 23. Abstracts of presentations at scientific meetings: 128. Books edited: 1. Book chapters: 7. Genes sequenced: 2. 1996: Visiting Fellow at the “Division of Geriatric Psychiatry” of “The Nathan S. Kline Institute for Psychiatric Research” of the New York University, U.S.A, to study Neurodegenerative Diseases. 1999: Visiting Fellow in the Department of Pathology at the University of Pittsburgh, U.S.A., to study Skin and Soft Tissue Pathology. 2002: Visiting Researcher at the Department of Morphology of the University of Geneva, Switzerland, to study Immunoelectron Microscopy Localization of Heat Shock Proteins. Many invited lectures at Universities, Congresses, and Public and Academic Institutions, especially on Chaperonology. Prof. Alberto JL Macario and Prof. Everly Conway de Macario, School of Medicine, University of Maryland at Baltimore, Baltimore, Maryland, USA. Dr. Anna M. Czarnecka, Laboratory of Molecular Oncology, Department of Oncology, Military Institute of the Health Services, Warsaw, Poland. Prof. Giovanni Li Volti, Department of Biological Chemistry, University of Catania, Catania, Italy. Dr. Antonino Di Stefano, Laboratorio di Fisiopatologia cardiorespiratoria, Fondazione “S. Maugeri”, Centro Medico di Veruno (Novara). Address: Department of Experimental Biomedicine and Clinical Neurosciences, University of Palermo - Via del Vespro 129 - 90127, Palermo, Italy. E-mail: francapp@hotmail.com. Telephone: +39/091/6553518 - FAX: +39/091/6553518. Websites: http://www.unipa.it/anatomy; http://www.unipa.it/francescocappello; http://www.unipa.it/asclepiade. Main research field: Role of molecular chaperones in tissue homeostasis and remodeling. Other research fields: Mesenchymal stem cells; cardiovascular diseases; human carcinogenesis. Quantitative changes in Hsp60 during the development of some tumors suggest that this chaperonin plays a role in carcinogenesis. A description of the specific role(s) of Hsp60 in tumor-cell growth and proliferation is still incomplete, but it is already evident that monitoring its levels and distribution in tissues and fluids has potential for diagnosis and staging, and for assessing prognosis and response to treatment. Although Hsp60 is considered an intramitochondrial protein, it has been demonstrated in the cytosol, cell membrane, vesicles, cell surface, extracellular space, and blood. The knowledge that Hsp60 occurs at all these locations opens new avenues for basic and applied research. It is clear that elucidating the mechanisms by which the chaperonin arrives at these various locations, and characterizing its functions in each of them will provide information useful for understanding carcinogenesis and for developing diagnostic and therapeutic tools for clinical oncology. Aging entails progressive deterioration of molecules and supramolecular structures, including Hsp chaperones and their complexes, paralleled by functional decline. Recent research has changed our views on Hsp chaperones. They work inside and outside cells in many locations, alone or forming teams, interacting with cells, receptors, and molecules that are not chaperones, in roles that are not typically attributed to chaperones, such as protein folding. Hsp chaperones form a physiological system with a variety of functions and interactions with other systems, for example, the immune system. We propose that chaperone malfunctioning due to structural damage or gene dysregulation during aging has an impact on the immune system, creating the conditions for an overall malfunction of both systems. Pathological chaperones cannot interact with the immune system as normal ones do, and this leads to an overall readjustment of the interactions that is apparent during senescence and is likely to cause many of its manifestations. 1. Czarnecka AM, Kukwa W, Krawczyk T, Scinska A, Kukwa A, Cappello F. (2010) Mitochondrial DNA mutations in cancer - from bench to bedside. Front Biosci, 15:437-460. 2. Macario AJL, Cappello F, Zummo G, Conway de Macario E (2010): Chaperonopathies of senescence and the scrambling of interactions between the chaperoning and the immune systems. Ann NY Acad Sci, 1197:85-93. 3. Corrao S, Campanella C, Anzalone R, Farina F, Zummo G, Conway de Macario E, Macario AJL, Cappello F, La Rocca G. Human Hsp10 and early pregnancy factor (EPF) and their relationship and involvement in cancer and immunity: Current knowledge and perspectives. Life Science, 86:145-152, 2010. ISSN: 0024-3205. 4. Merendino AM, Bucchieri F, Campanella C, Marcianò V, Ribbene A, David S, Zummo G, Burgio G, Corona DF, Conway de Macario E, Macario AJL, Cappello F. (2010) Hsp60 is actively secreted by human tumor cells. PLoS ONE, 5:e9247. 5. Song F, Shan Y, Cappello F, Rappa F, Ristagno G, Yu T, Li Volti G, Sun S, Weil MH, Tang W. (2010) Apoptosis is not involved in the mechanism of postresuscitation myocardial dysfunction in a rat model of cardiac arrest and CPR. Critical Care Medicine, 38:1329-34. 6. Cappello F, Marino Gammazza A, Zummo L, Conway de Macario E, Macario AJL. (2010) Hsp60 and AChR cross-reactivity in myasthenia gravis: an update. J Neurol Sci, 292:117-118. 7. Alaimo M, Aiello G, Marino E, Zummo L, Cappello F. (2010) Taravana. Documentation of bubbles by computerized tomography. J Neurosurg Anesthesiol, 22:271. 8. Czarnecka AM, Czarnecki JS, Kukwa W, Cappello F, Scinska A, Kukwa A. (2010) Molecular oncology focus - Is carcinogenesis a 'mitochondriopathy'? J Biomed Sci, 17:31. 9. Rodolico V, Tomasello G, Zerilli M, Martorana A, Pitruzzella A, Marino Gammazza A, David S, Zummo G, Damiani P, Accomando S, Conway de Macario E, Macario AJL, Cappello F. (2010) Hsp60 and Hsp10 increase in colon mucosa of Crohn's disease and ulcerative colitis. Cell Stress Chaperones, 15:877-884. 10. Cappello F, David S, Peri G, Farina F, Conway de Macario E, Macario AJL, Zummo G. (2011) Hsp60: molecular anatomy and role in colorectal cancer diagnosis and treatment. Front Biosci (Schol Ed). 3:341-51. 11. Novo G*, Cappello F*, Rizzo M, Fazio G, Zambuto S, Tortorici E, Marino Gammazza A, Corrao S, Zummo G, Conway de Macario E, Macario AJL, Assennato P, Novo S, Li Volti G. (2011) Hsp60 and Heme Oxygenase-1 (Hsp32) in acute myocardial infarction. Transl Res. 157:285-92. 12. Tomasello G, Rodolico V, Zerilli M, Martorana A, Bucchieri F, Pitruzzella A, Marino Gammazza A, David S, Rappa F, Zummo G, Damiani P, Accomando S, Rizzo M, Conway de Macario E, Macario AJL, Cappello F. (2011) Changes in immunohistochemical levels and subcellular localization after therapy, as well as correlation and co-localization with CD68, suggest a pathogenetic role for Hsp60 in ulcerative colitis. Appl Immunohistochem Mol Morphol. 2011 Mar 25. [Epub ahead of print].